At its I/O developer conference in May, Google announced its plans to bring support for Android apps to Chrome OS; it subsequently launched Google Play on the platform’s developer channel for Chromebooks in June. Now, Google Play is rolling out to the stable channel. It’ll arrive in beta over the next several days in Chrome OS v53.0.2785.129 for the Acer Chromebook R11 and the Asus Chromebook Flip. That means you’ll be able to download, install and run Android apps natively on your Chromebook. 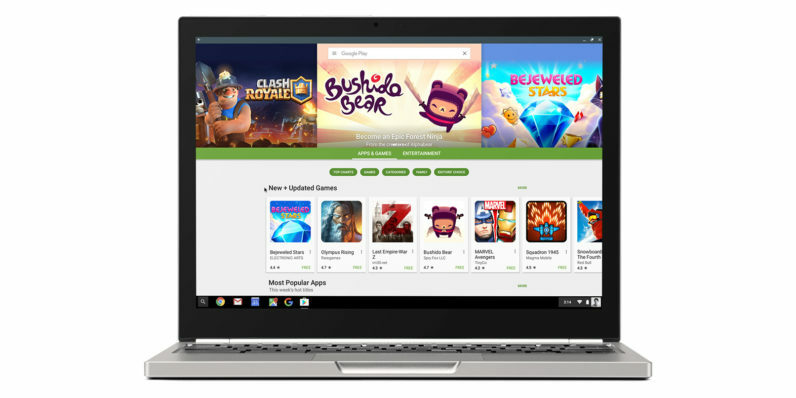 Google noted that it would make its app store available on more Chrome OS-based machines later in the year. Of course, the majority of Android apps weren’t designed for use on laptops, so it’s possible that you’ll find them a bit finicky. VentureBeat noted that the game Dots was basically unplayable on the trackpad and was easier with a touchscreen. Still, the announcement makes a strong case for getting a Chromebook. In addition to running Android apps, a Chromebook will soon be the only way you’ll be able to use Chrome apps, and CrossOver has released a tool that lets you run Windows software on Chromebooks. Plus, they might soon begin including fingerprint scanners for quicker logins. Google also said in May that new hardware, designed specifically with handling Android apps in mind, is slated to arrive later this year. It’s possible that we’ll see a new Chromebook on October 4; the company is hosting an event where we’re almost certain it will showcase new gadgets.